From the multiple high carbon steel alloys that comprise the blade to its distinctive blend of traditional form and wicked modern accents, the Blue Knight Katana is a bold mashup of electrifying contrasts. 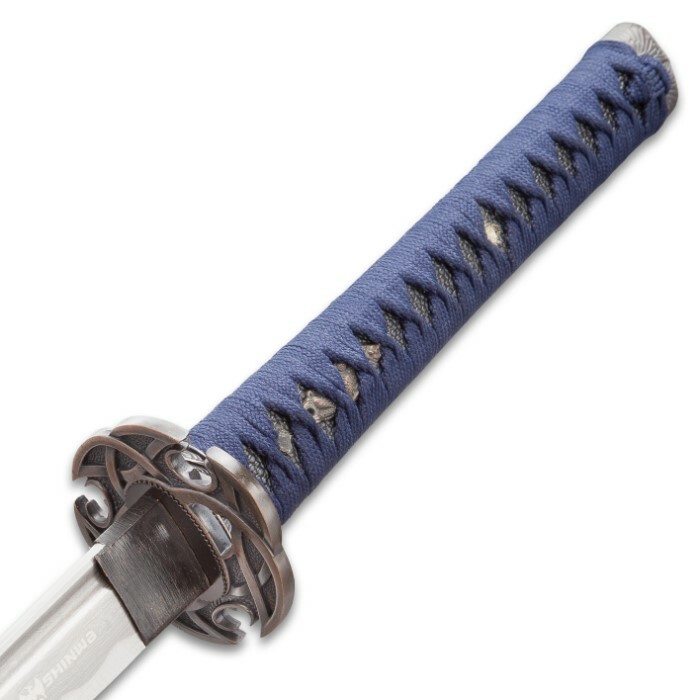 Though it pays homage to Japan’s ancient swordcraft tradition, Shinwa developed the distinctive Blue Knight with today’s serious swordsman in mind. Master smiths painstakingly hand forge every blade, and seasoned sword artisans carefully handcraft each tsuka and saya. 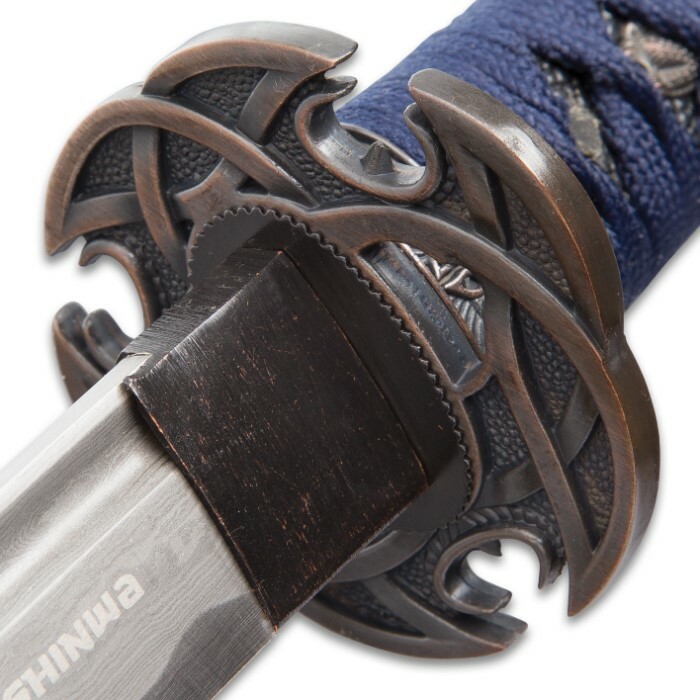 From vigorously hammering the molten blade steel to gingerly wrapping faux ray skin and cord around the tsuka, every step in the Blue Knight's construction receives the utmost care and precise attention to detail. Some of the world's - and indeed history's - most revered, time-tested techniques are employed, and every material meets or exceeds stringent quality standards. A quintessential example is the Blue Knight's eye-catching Damascus steel tanto blade, which teems with potency and visual splendor – a spectacular wonder in its own right with its contrasting lines, waves, swirls and other mesmerizing patterns. Each line is a distinct variety of steel, hammer welded and folded repeatedly to yield the thousands of layers in each Blue Knight blade. The unique metalsmithing technique’s roots stretch back to the Middle Ages, and today it’s still painstakingly performed by seasoned hands, unsullied by soulless automation and disconnected mechanization. In a nutshell, a master Shinwa swordsmith from the ancient sword-making village of Longquan fires a stack of steel strips - each a different alloy - in a white-hot forge until the metal glows cherry red. He then removes the stack and hammers it until it’s around half as thick as the original. Then he folds the metal onto itself lengthwise and hammers each half together. The process is meticulously repeated until the desired layering effect is achieved, at which point a final quenching strengthens the resulting blade blank and an acid etching highlights vivid contrasts in the layers. And the slow, laborious process itself it just the beginning! In order to achieve sufficiently dramatic contrasts, Shinwa’s master smiths must expertly select an appropriate combination of steel alloys of varying color, luminescence and other visual qualities. For the sake of strength, resilience and countless additional blade factors, the smiths must also must consider each alloy’s distinct melting point, proper stacking order, forge temperature and myriad other variables. Simply put, an unbelievable quantity of blood, sweat and tears goes into every Blue Knight blade, but lay eyes on it just once, and you’ll know it was well worth the trouble. Furthermore, like a steel snowflake or fingerprint, the patterning on no two Blue Knight blades is exactly alike. But the Blue Knight is so much more than a pretty face. More like a “wild beast decked out in regal robes,” the Blue Knight’s stout tanto blade slices cleanly and effortlessly through rolled tatami mats, thick bamboo and other tameshigiri standards, retaining its razor sharp edge through it all. The Blue Knight's weight is shrewdly distributed to maximize swinging momentum and power, blow after devastating blow. This impeccable balance also improves control and responsiveness, allowing for greater agility and flexibility in combat. 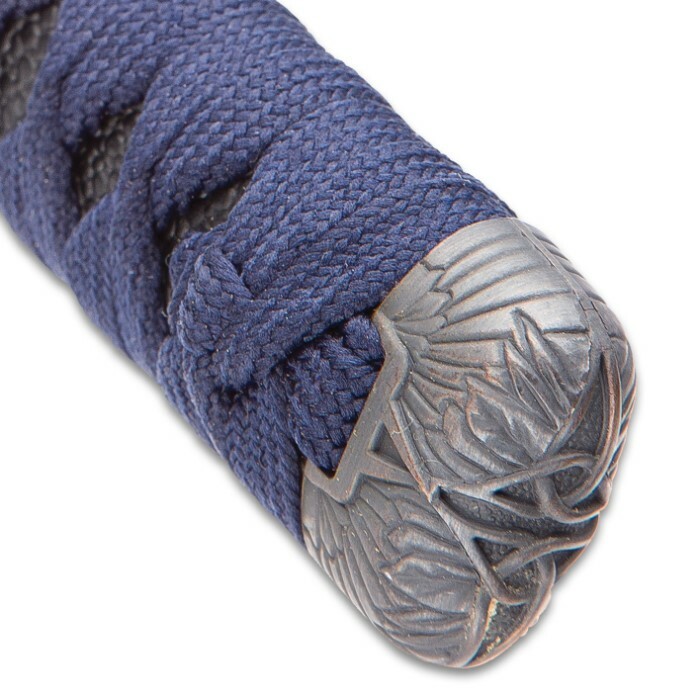 The faux ray skin and classic ito that encircles the tsuka affords a comfortable, no-slip grip, further enhancing the Blue Knight’s superb feel. Flawlessly cast, the tsuba adds a striking touch of contemporary appeal with its eye-catching relief work and biohazard-esque design. The Blue Knight has proven itself time and again, and it holds its own against any of today's most expensive katana, outperforming many. 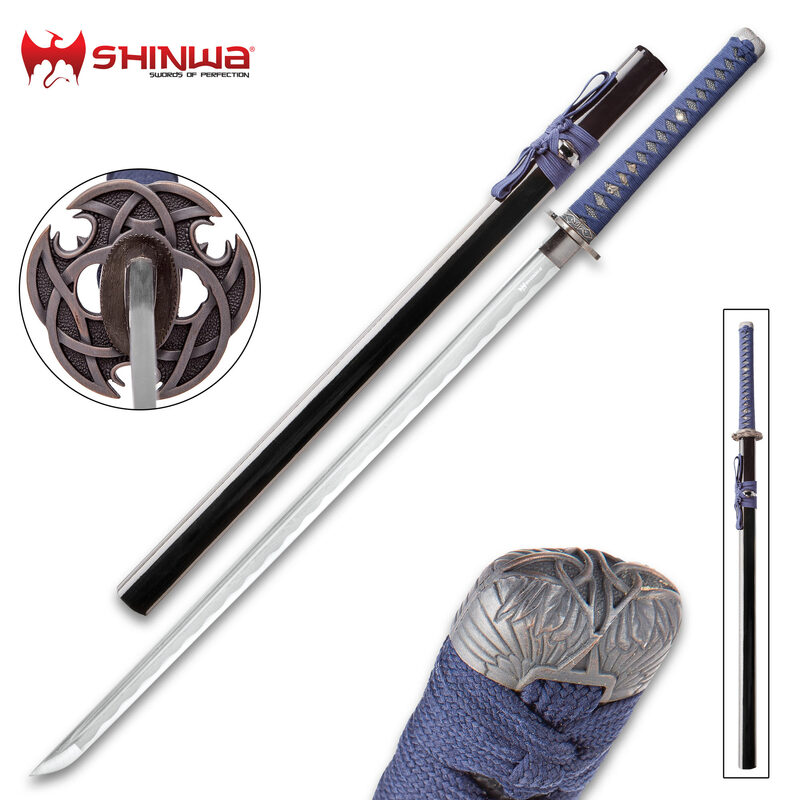 But the old cliché is true - "action" does indeed "speak louder than words," and at this unbeatable, downright unheard of price, why deny yourself the opportunity to experience Shinwa's Blue Knight Katana for yourself? No matter how you use it, with proper care you can enjoy it for a lifetime, then pass it down to your children, grandchildren or great-grandchildren! 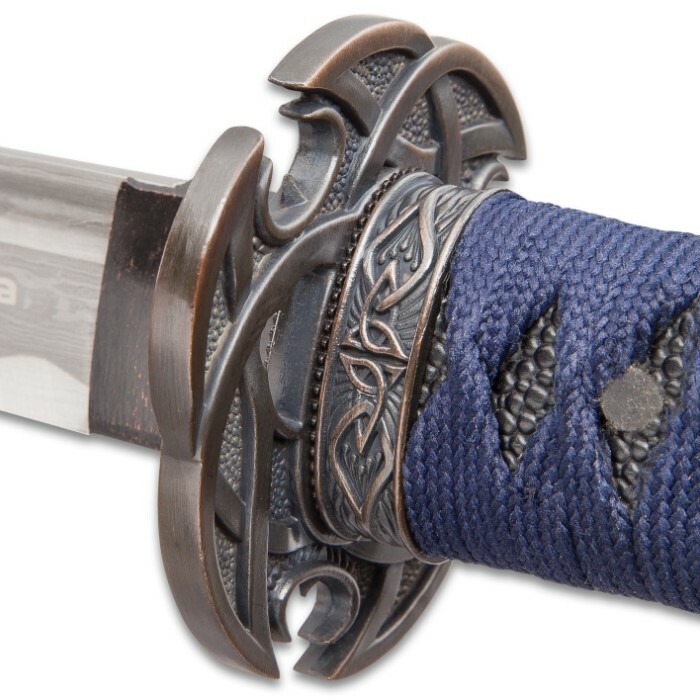 The Blue Knight is heirloom-quality and built to be treasured by generations of your descendants - your legacy preserved in hand forged Damascus steel. 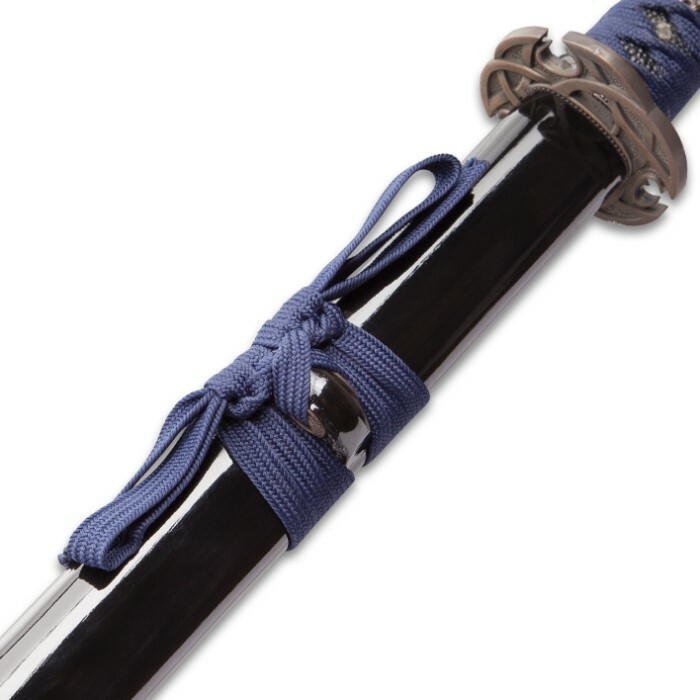 This sword is beautiful, it is way darker than it appears in the Provided photos the tsuba is almost black than silver or bronze, the ito and mekugi is a dark navy blue . It’s a great looking sword and worth the money. This Sword is as Budk states. Its function is not outweighed by its beauty. 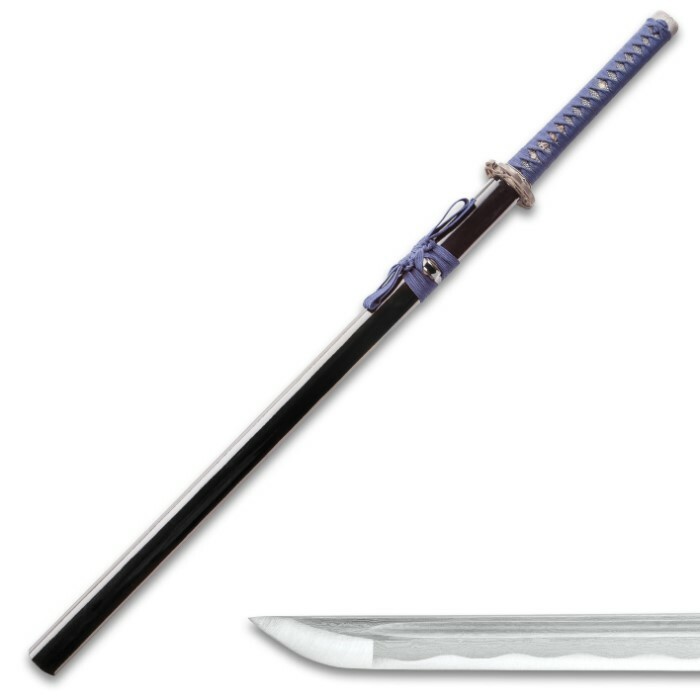 Yes there are Shinwa swords that ooze lavish in all the details, but do not be dismayed by its ability to deliver in its feel and function. I actually like the simplicity of this Katana. The blade has this attractive matte Damascus effect that's really impressive if you can appreciate what it really takes to produce. So much I like this blade, that I have two of the Blue Knight Swords. They proudly hang next to the regal and not so regal alike! after all a quality sword is truly measured by its ability to perform, not always about how much bling it sports! I've owned a few fully functional blades but this was my 1st Shinwa. I admit it has met my expectations of a good blade and it has withstood 1/8 plywood...medium sized logs and old fashioned dense plastic milk crates...but against bamboo and even glass (I've had blades that deal with glass just fine) will be the ultimate tests for this weapon...looking forward to performance results! Solid and well made. The finish work on the edge was a little weak. Especially near the handle and after disassembly the tang was rough... very rough. Absolutely no finish work at all there. Just ground down and left. But that’s been standard with all of the Shinwa blades I’ve purchased. Not really a big deal... Honestly other than the rough ground tang I have nothing negative to say about this. It’s a good solid katana for the beginning collector and well worth the price. Even the bag was decent. This is my second sword, I’m just starting my collection but I must say I love the way this one feels and looks. I already love it more than my first sword! Great sword I use mine all time. I ordered two during a Buy One Get One Free sale, one for myself and one to give to my brother for Christmas when it came around. They took about a week to get here and when they got here I found one of the blades was absolutely perfect... the other blade had a dull spot on it, so much so I could run my finger up and down and not get cut at all, but at least the area near the tip was sharp. I do recommend the sword if you can get one that's well-made, just order knowing it might not be perfect.